Do you have a huge music collection already? Is most of it in mp3? Would you like to have some of the tracks as ringtones? If the answer is yes, you need two pieces of software, the first being Fre:AC, the second being Audacity, both of which are free. The next thing you need is a bit of knowledge. An apple ringtone is a .m4a (mp4 audio) file renamed .m4r, i.e. songname.m4a renamed to songname.m4r, it’s that simple. The rule is up to 30 seconds, the device will read the file as available for both txt-tone and ringtone, over 30 seconds it’s a ringtone only. How to you get .m4a files from your .mp3 files – use a converter, such as Fre:AC, you can convert the file to .wav first, edit the .wav file in Audacity (Trim the file to the right length, and you can play with the volume etc), and then convert the file from .wav to .m4a; finally just rename to .m4r and copy over to your device using CopyTrans Manager. Have a lot of music in iTunes, want to manage it with a product such as CopyTrans Manager, or just want it as .mp3 files instead? Easy! 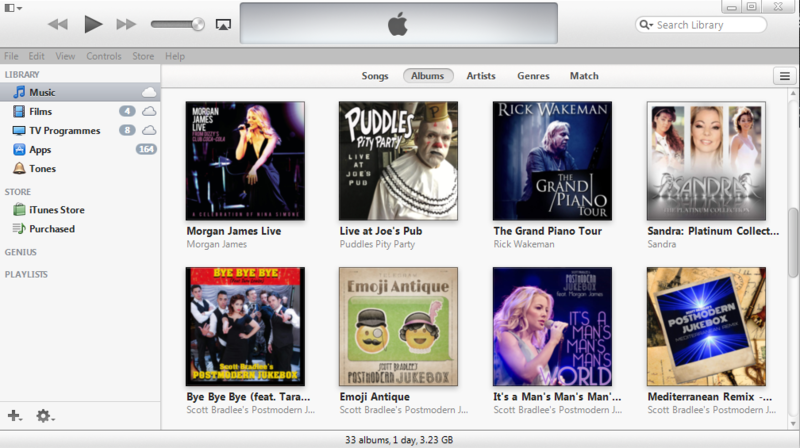 iCloud is a wonderful thing, it can save your arse in a pinch, store all your stuff, and be available cross platform. If you install it on your PC it’s a nice easy way of transferring files (Think PDFs, Docs, Excel sheets etc); you can even keep special collections of pictures in the iCloud Drive – really anything you want. It’s cheap online storage as well, check out the Storage Plan pricing here, at the moment, in the UK, 50gb of online storage costs only £0.79 a month – Very Cheap! 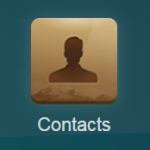 You can use iCloud from your e-mail on your apple device to store e-mail attachments straight to the drive – just press and hold on the icon for the attachment and select the iCloud Drive > Export to this location options (When you’ve selected a folder), and it’ll save right there – the file will then be available on all devices you’ve logged into with iCloud, all your iDevices and your PC / MAC etc. 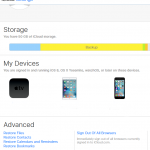 Restore the automatic backups of Files, Contacts, Bookmarks or Documents from the iCloud at any time. It’s a little known thing, but Apple introduced automatic timed snapshots for your files, contacts, bookmarks and documents a while back. 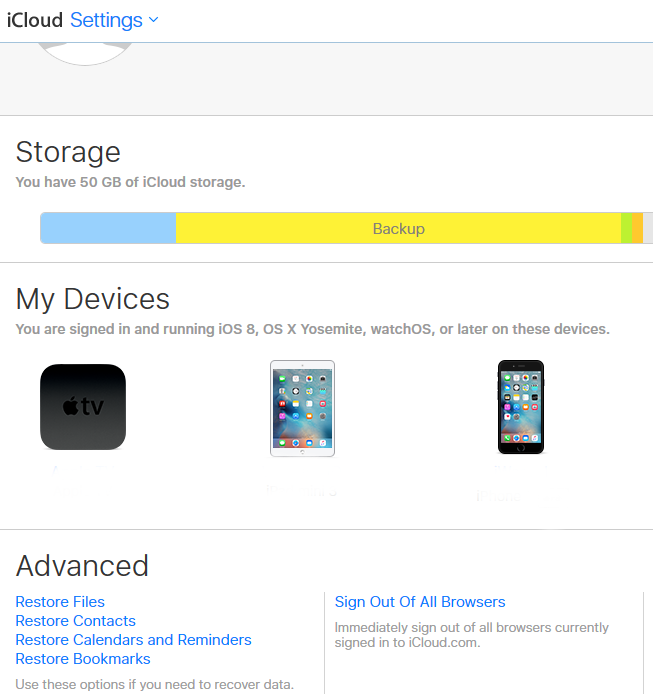 This means that when visiting the iCloud website, and hitting settings (As pictured), you can select to restore any of the items. Further to which, if you dive into the items, you’ll get further options to restore from which snapshot. 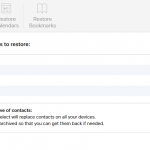 However, be aware that the restored versions will completely replace your current ones, so if you’ve made changes since then, the changes will be wiped from your device; however saying that – the current version of the item you’re restoring will be stored as a snapshot. For those Windows users who have experienced Shadow Volume Copy Restore – it’s almost the same thing. My one wish with the automatic backup in tip 5, is that Notes should be covered as well – I have a metric fuckton of notes, and am always wary about losing ’em. On the topic of Notes, there is a third-party backup solution by CopyTrans called CopyTrans Contacts – whilst you do have to pay for this piece of software, it’s more than worth it for piece of mind – CopyTrans Contacts not only performs a backup all your contacts, notes from both your devices and the cloud (All of the cloud, not just iCloud), but also all text / iMessage messages, in several formats, including attachments. The message backup function is excellent and goes above and beyond Apple’s own offering of a blanket backup. It will allow you to export to a range of formats, including a spreadsheet, based on conversation order, and individual html files, again including the attachments. Next Next post: NSFW! : Happy Swearing Sunday!